Pretty much everyone has some kind of personal electronic device these days. Cell phones, music players, GPS... you name it. All of them are battery powered and need a way to charge. It seems that they all come with at least a wall charger (120V). Some come complete with a 12V "cigarette lighter" style plug. After a while, you end up with multiple chargers and multiple cables. It gets worse if you need a DATA cable to connect your device to your computer. I had so many that I was forgetting which ones went to which devices. Yes, I should label them... but I didn't. There HAD to be a better way! If you go out on the internet and look up USB charge cables for your particular device(s) you'll find lots of them, in a bunch of different sizes. I like to order one 3 foot (1 meter) one and one 9 foot (3 meter) one for each device. 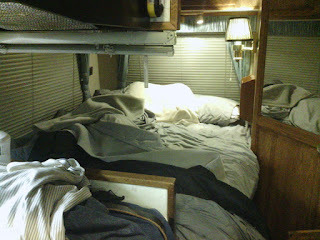 That gives me some flexibility when plugging things into various 120V and 12V outlets around the RV. Make sure that one side of all the cables have a regular USB plug. This is the one that's plain and rectangular. Now you'll need the generic 120V and 12V chargers for these cables. They are REALLY inexpensive. I have seen folks online trying to sell these for $39.95! DO NOT get suckered in. Look around, sometimes they will have to be shipped from China, sometimes they are local, but shouldn't cost more than $2.00 for each one. I purchased a few of each style (120V and 12V). Since they are so small, they store easily in various places. I keep a set in the bedroom area and a set up front, just for convenience sake. Make sure that they will put out 1 Amp (1000 milliamps). This will make sure they can charge even the most power hungry devices. You can buy them in higher current (amps) ratings, and some devices REQUIRE more than 1 Amp. Check all of your devices before you buy!!! I have a tablet/keyboard dock combo that looks like it uses standard USB charging... but doesn't. I needed a special cable and charger. Which I marked with paint specifically so I don't destroy any other device with it's charger. It uses 12V to charge rather than the 5V most devices use. While I used to have 5 devices with 5 120V chargers (with attached cables) and 5 12V chargers (also with attached cables), now I only need to have 3 cables and 2 chargers. You may have more cables. Right now all my devices use either USB, Mini-USB or Micro-USB, so a cable for each. Add in the 3 longer cables and a few spare chargers and I am WAY ahead. Another great thing? Any one of the chargers will work with any cable. Automatic redundancy in case something fails. Lighter, less clutter and better performance. A Win-win! I'm always on the lookout for products that will make my life easier. 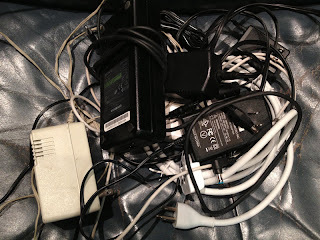 In this case, I am not attempting to keep track of multiple chargers for multiple devices in multiple voltages. Bleh. If one failed, I couldn't really charge the device. Like the Boy Scouts of America....always be prepared!